User Summary: A traditional version that replicates the original versions of the game from India. It includes a canvass "board," wooden beehive pieces, and wooden oblong dice. 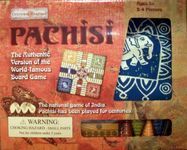 The pieces and dice can be stored in a pocket built into the "board," and rolled up for storage, like the "traditional" games in India.